Lic India Recruitment 2016 has been going to announces Recruitment for the posts of various posts. 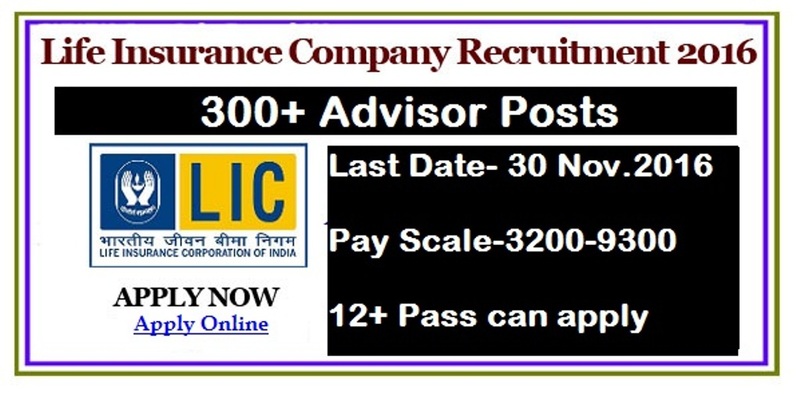 There are total no of vacancies 320.Eligible Candidates may apply online form to this Websitewww.liconline.nic.in. Opening date for this Govt job is 28 Oct.16.and Closing date is 30 Nov.16.Other details Like Educational Process, Pay Scale, Age Limit Selection Process are given below. No of Vacancies - Advisor-260 posts. Age limit - Candidates age should be 18to 33 years as on 7-10-17for post 1,18to 55 years for 5-10-16. Educational qualification- Candidates should passes HSC for Post 01, HSC and Diploma and Gradation and Post Graduation for post 02.
have to pay Rs.50/ and other Category Candidates not to pay fee. Selection process- Candidates will be selected on the basic of Physical test, Practical trade test, written test.